We’ll start with fixed wing aircraft. Next up is a Russian MiG-23 “FLOGGER”, brought to us by a Soviet defector. The MiG-23 is a swing-wing design aircraft, similar to the F-14 “TOMCAT”, and was the first Soviet jet designed for beyond-visual-range combat. A somewhat capable air-to-air fighter, most countries utilize this in an air-to-ground role for its primary mission as you can see here with the rocket pod and gravity bombs. This one is either an “M” or “MF” variant, which you can tell by the IRST (Infrared Search and Track) in the nose. First up is the Improved Homing All the Way Killer, also known as the “I-HAWK”. Originally designed and used by the United States the “HAWK” and later “I-HAWK” were proliferated to allied nations, including pre-revolution Iran. Whoops. Despite being smaller in size to contemporaries such as the Soviet SA-2, the “HAWK” maintains comparable abilities in terms of effective range and altitude. A dummy for the “HAWK” series of launchers. Now for the Soviet systems. 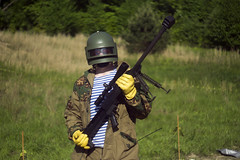 Starting off is the SA-2. This SAM is credited with the first ever kill of an aircraft by a surface-to-air missile, shooting down a Taiwanese spyplane in 1959. The next year a U-2 was shot down over the Soviet Union, and in 1962 another U-2 was shot down over Cuba. The SA-2 remains in service in roughly 20 countries today. Coming in at the size of your average telephone pole, the SA-2 is one of the larger SAM still in use. Next is the SA-5. This system has nearly five times the range of the SA-2, providing the user a massive amount of stand-off range against aerial threats. The SA-5 has been used as recently as February 2018 by Syria firing multiple missiles at Israeli threats over the last several years. This is actually a 3/4 scale mock-up of the SA-5. (You’ll see a full size missile below). On lower left we have a full size SA-5 missile. To its immediate right is a SA-12 dummy and a dummy SA-12 missile. In the background to the left is an SA-11 “FIREDOME”, and behind that is the launcher for the SA-6 with its radar (the “STRAIGHT FLUSH”) on the right next to the SA-12 missile tubes. For the conclusion of this section there is the “LONG TRACK” acquisition radar. Originally designed to support the SA-4, it now primarily supports other legacy systems such as the SA-2, SA-3, and others. The “LONG TRACK” was the first radar in Soviet service designed with mobility in mind. The dish can be folded up for storage and rapid deployment. Room for you and five /k/omrades. (Out of camera are some nice little fans to make sure you don’t get too toasty when nuking your “tendies” with the UHF (Ultra High Frequency) radar sitting a few feet above your head). These are for the “ground pounders” out there, various types of armored vehicles. Starting with one of the greatest tanks of WWII–sans improvised infantry armor–the T-34. The T-34 is the second highest produced tank of all time, and is still in service with a handful of nations despite being first designed in 1937. The BMP-1 infantry fighting vehicle. Designed to provide firepower and mobility to troops across nuclear and conventional battlefields. The combination of a 73mm cannon and coaxial 7.62mm gun made the BMP-1 a formidable IFV (Infantry Fighting Vehicle) during its heyday. Here the trim vane is erected (OwO) to allow for amphibious operations. The T-62 MBT has seen combat in over 20 conflicts across the world, and was the first Soviet tank to use sabot style non-explosive rounds. 115mm of smoothbore goodness. (Muzzle discipline not pictured). The M1939, also known as the KS-12 is an 85mm Air Defense Artillery piece capable of being aimed via radar or visually by the operator. While designed as an anti-aircraft weapon, the KS-12 was also used in an anti-armor role during WWII, similar to the German 88mm flak guns. A view from the operator’s seat. You’ll be able to hit targets up to 40,000ft and higher, not that you’ll know one way or the other. Our final section: Rotary Wing Aircraft. The Mi-24 HIND is a Soviet era gunship and light troop transport aircraft with no direct counterpart in Western militaries. The Mi-24 is armed with a 12.7mm Gatling gun, has six hardpoints for use with rockets, missiles, and other weapons, and is capable of carrying up to eight troops in addition to the aircrew. Though typically used in an air-to-ground role, a renegade member of US special forces managed to shoot down a pair of USAF F-16 fighter jets with a D variant HIND. Spoiler alert: All of the gauges are actually paper cut-outs. Not really sure why that is, or why the stick is missing. On a positive note, the flight controls are still hooked up and move components when manipulated. The Nellis Test and Training Facility was an awesome experience, and even though I managed to snap around 200 pictures, I definitely plan on going back when I have more than a few hours to spend. I might do some follow-up articles taking deeper dives into specific equipment after my next trip.